Hey! Every year end I will be looking forward to Starbucks® new limited holiday beverages and of course their planner. And finally they are here! The Blend Is The Magic for Starbucks® 2018 seasonal handcrafted holiday beverages, along with the special Holiday Blend whole beans, Starbucks gifting cards and an exclusive selection of curated merchandise. This holiday is even merrier with the brand new Starbucks® Snowy Cranberry Latte and also bringing back holiday favorites for a limited time: Toffee Nut Crunch Latte and Peppermint Mocha that will be sure to get you in the spirit of the season with just one sip. Returning Favourite! Starbucks® Toffee Nut Crunch Latte: Ring in the Holiday season with the subtle caramelly sweetness of the Starbucks® Toffee Nut Crunch Latte, topped with whipped cream and a sticky toffee crunch. The rich buttery toffee flavors and aroma of toasted nuts make the perfect partner for Starbucks® espresso roast. Returning Favourite! Starbucks® Peppermint Mocha: Indulge in the traditional holiday flavors of the Peppermint Mocha, a combination of espresso and steamed milk sweetened with flavors of chocolate and peppermint. Topped with whipped cream, mocha drizzle and candy cane pieces. Starbucks 2019 Planner, redeemable from 20th November onwards with the purchase of any three Grande or Venti-sized Starbucks Holiday Beverages, and 12 other Grande or Venti-sized of any Starbucks handcrafted beverages made from 13th November onwards. Starbucks Holiday new merchandise series ‘Winter is Coming’ and ‘Santa Has Arrived’ featuring mugs, tumblers, cold cups, and tote bags featuring intricate snowflakes, golden snowballs, the enchanting woodland and bright, playful patterns of reindeers and blossoming mistletoe. In addition to the merchandise collection, Starbucks is introducing the Starbucks® Snow Globe with Starbucks motifs including a miniature to-go cup, coffee beans and our local Malayan Tiger (Harimau) in an iconic green apron. If you are not sure what to get for your colleagues or friends, the Starbucks® Holiday gift cards make gifting a breeze and will put a smile on their face. Not forgetting the return of its most beloved roast coffee beans, Starbucks® Holiday Blend, together with Starbucks® Holiday Blend Espresso Roast and Starbucks® Holiday Blonde Roast. Those looking for a quick fix can explore the Starbucks® VIA Holiday Blend – an instant holiday classic made from the same signature blend of rare aged Sumatran coffee with lively Latin American beans and mellow Indonesian beans. Alright! That’s about it about Starbucks® 2018 Holiday offerings and now I need my coffee! 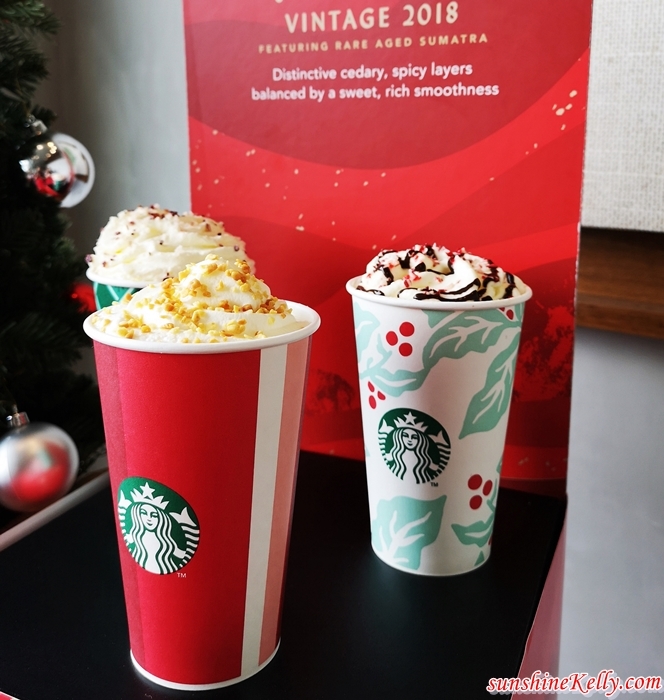 Starbucks® Snowy Cranberry Latte, Starbucks® Toffee Nut Crunch Latte and Starbucks® Peppermint Mocha are priced at RM17 onwards available at all stores from 13th November. The Starbucks® Holiday Blend, Starbucks® Holiday Blend Espresso Roast and Starbucks® Holiday Blonde Roast are priced at RM40 onwards, while the Starbucks® Holiday merchandise collection will be available in stores starting 13th November onwards.